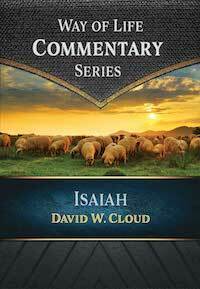 Commentary on the book of Isaiah. Isaiah is the Hebrew Yesha-yahu or Yeshayaw, meaning “Jehovah is salvation.” It is synonymous in meaning with Joshua and Hosea. Isaiah was one of the most talented and influential men of history. He was a prophet, a preacher, a theologian, a social critic, a statesman who advised kings, a poet, a psalmist. Isaiah is greater in scope and depth and beauty than any other prophet. It comprehends and anticipates all the other prophetic books. Isaiah is a whole Bible in itself. It is an infinite book. The believer could study Isaiah for hours every day of his life and not begin to come to the end of its teaching. The overall theme is found in Isaiah’s name, which means “Jehovah’s salvation.” It refers to the salvation of Israel (Isa. 45:17), the salvation of the Gentiles (Isa. 45:22), and ultimately the salvation of the creation through Christ. Isaiah sees a new heaven and a new earth (Isa. 66:22). The book of Isaiah has been called the little Bible because both Isaiah and the Bible have 66 chapters, and both are further divided into 39 chapters and 27 chapters. Book: Softcover, 422 pages, 5.5 x 8.5 in.